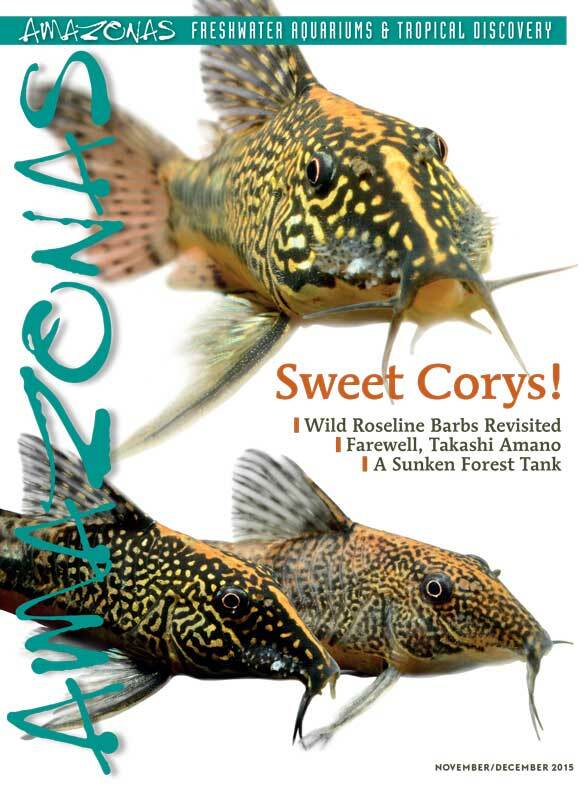 Cover with three eyecatching Bearded Corys, Scleromystax barbatus, photographed by Hans-Georg Evers. SUBSCRIBE and don’t miss this big issue—just $29 per year. Already a subscriber? ACCESS The Issue Now! 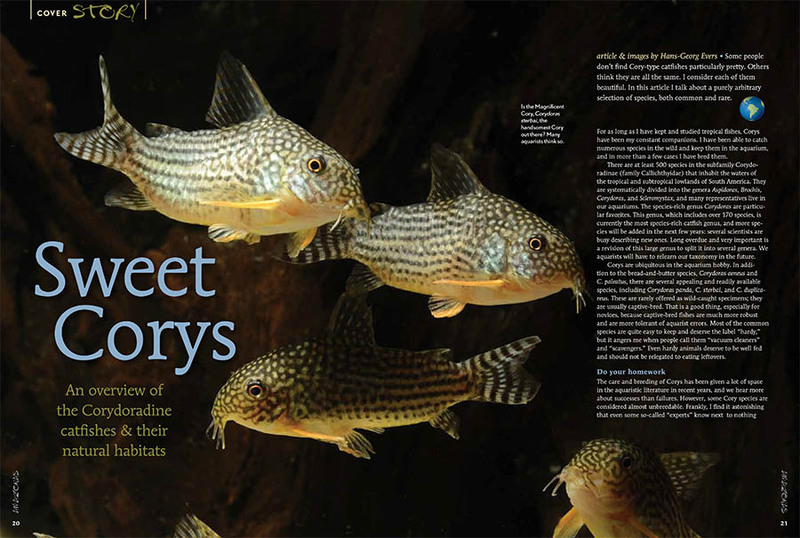 Opening spread to almost two dozen pages of cover features section devoted to Corydoras Species & Habitats, with an introduction by Cory expert and AMAZONAS German Editor Hans-Georg Evers. 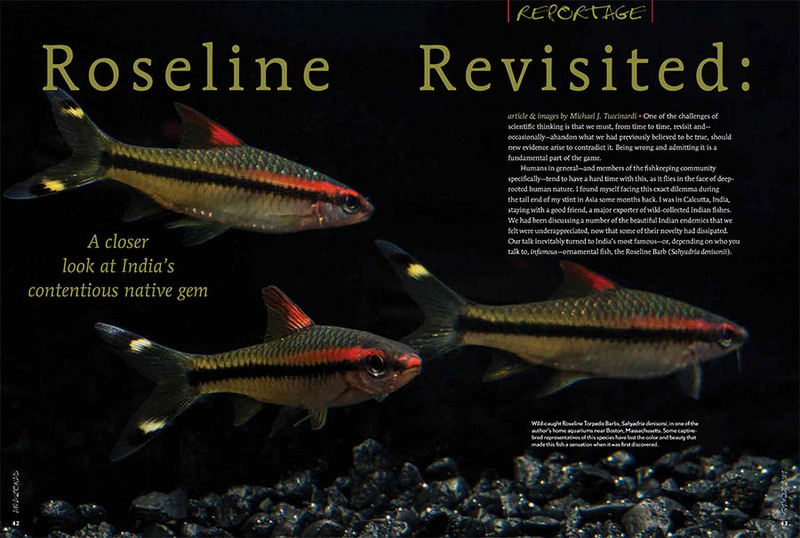 The glorious Roseline Barb, Sahyadria denisonii, also known as the Torpedo Barb or sometimes as Miss Kerala is an Indian endemic whose popularity as an aquarium fish has brought fears that it is being harvested into extinction. 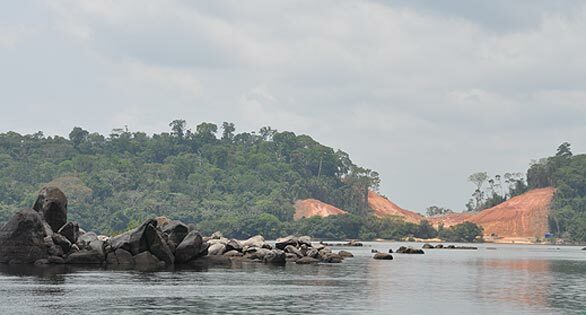 AMAZONAS Senior Contributor Michael Tuccinardi heads to the Malabar Coast of India to assess a controversial story. 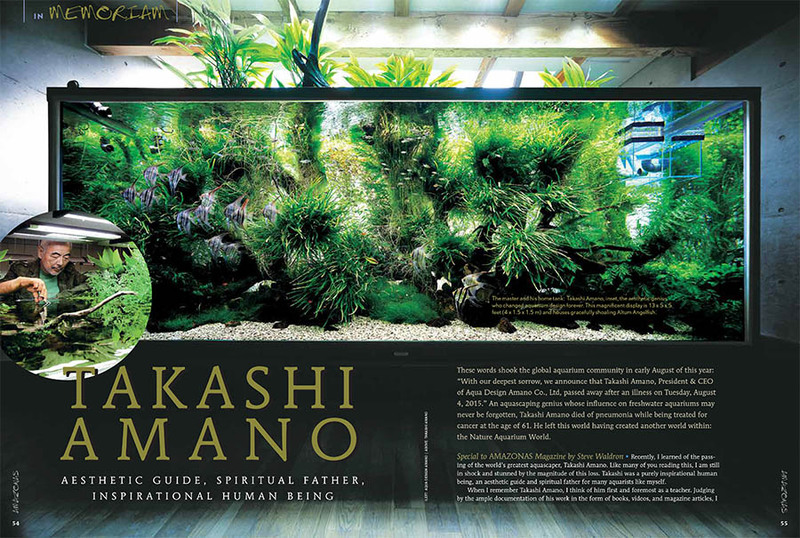 AMAZONAS contributor Steve Waldron offers a tribute to the recently departed aquascaping genius, Takashi Amano, who died in August at the age of 61. The Master’s own magnificent home aquarium in Japan is shown here. 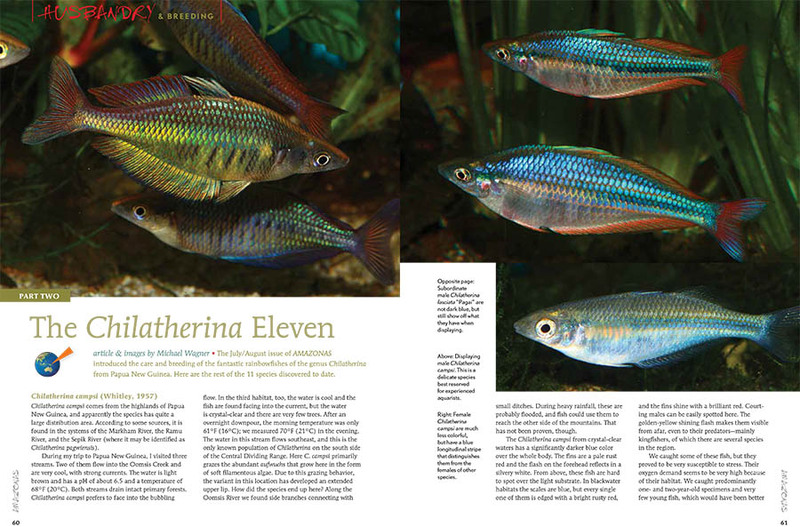 For lovers of the sleek, peaceful rainbowfishes of Australia and Papua New Guinea, the small (11-species) genus Chilatherina is a favorite. Michael Wagner describes their origins and their distinctive charms. 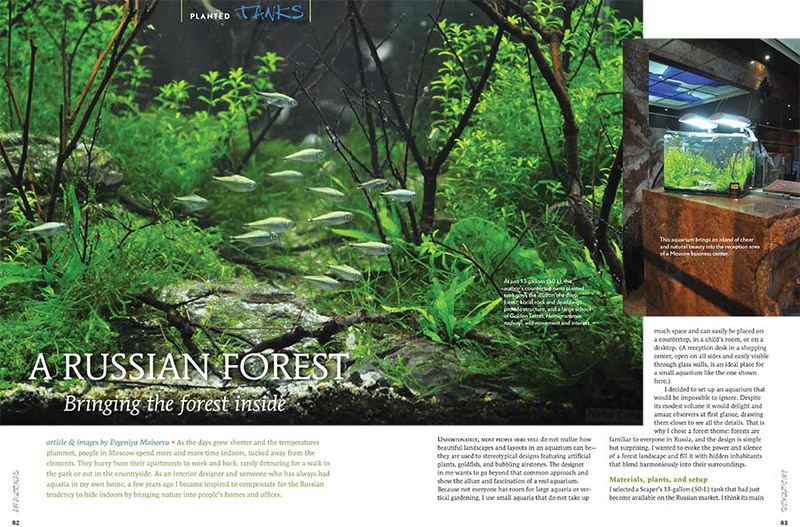 An emerging new star in European planted tank competitions, Evgeniya Moiseeva tells how she brings her interior designer skills to creating a sunken forest tank to brighten the long winter days in Moscow. 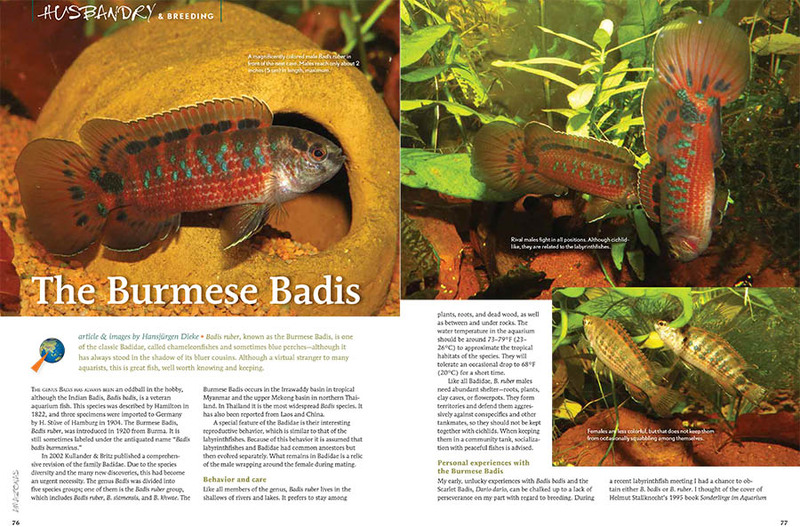 An unusual fish with behaviors similar to those of dwarf cichlids, the Red or Burmese Badis, Badis ruber, is a rarity well worth tracking down for its beauty and fascinating breeding displays. 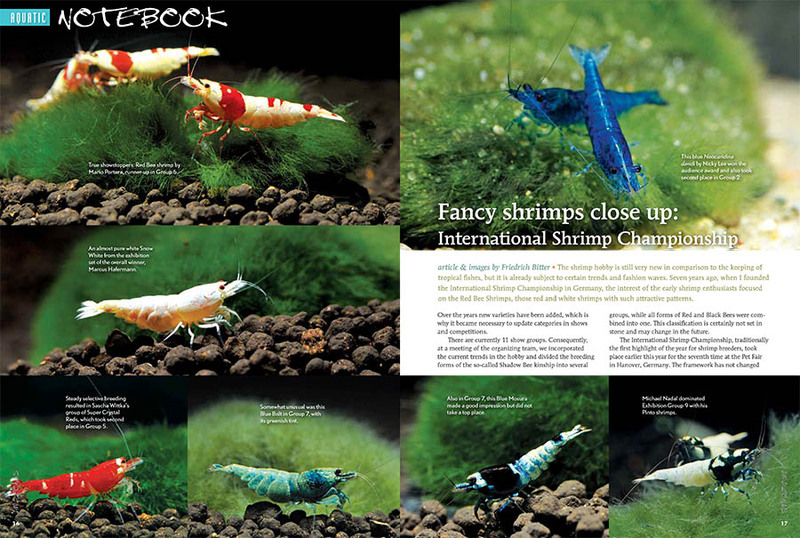 European competitions often provide previews to coming trends in the breeding of fancy dwarf freshwater shrimps. 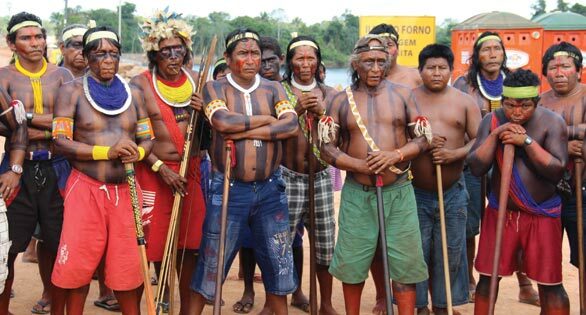 Bee Shrimp pioneer Friedrich Bitter brings AMAZONAS readers the showstopping winning shrimps from earlier in 2015. Update: We initially referred to Badis ruber as a “labyrinth fish” in the caption above. This was our editing error. They share relatives with the labrinthfishes. The magazine has it right.